Good morning! 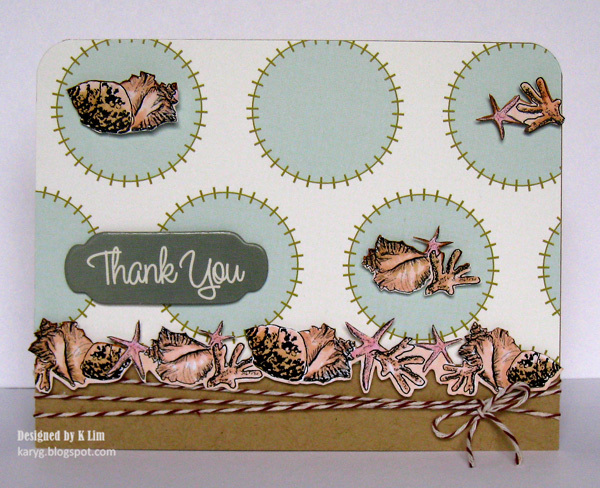 Simple card today using the StampTV kit "Falling for You", I hadn't had a chance yet to get any of these images inky, so I put them all together! My inspiration for the colors was this fun Basic Grey Sugar Rush DP, the bird and flowers are stamped in black and colored with Copics and the branch is stamped in Memento London Fog. I popped up the bird and embossed some dots on the flower panel with the Scor-Bug. Cardstock is Pure Luxury Red Hot and White, ribbon is Pure Luxury 5/8" stitched. Just a fun card, THANK YOU for visiting today! Good morning! Today I have a card for you where I used one of the borders from my "The Vine" set with the fence from Theresa's "Heartfelt". Cardstock is Pure Luxury Fresh Asparagus and White. I stamped the fence first at the bottom of my at and then stamped the vine right over it. Just trace the vine with the green over the boards, coloring as you normally would. It's okay that the lines overlap because then you'll stamp the vine again, color and cut out just the leaves that intersect the fence lines on the bottom section and pop them up over the image. Next stamp and colored several individual flowers from "The Vine"to add with glue dots at random. Finally I drew just a few lines with a black pen to connect the second fence section to the first as well as one underneath the climbing vine to make it look like the side of a house. (I got a smudge on the top right of my mat so I had to stamp another vine to cover it, but it does make a better frame!) I used W-3 to make some streaks on the board and shade the fence posts, YG63 and Yg67 for the leaves and R20 and RV34 for the flowers. Use the same greens to make some little flick below the fence for grass. I plan to do another card like this except I will do a lot of sponging to make a sunrise or sunset, but for this first one I decided to keep it simple, the white space is very "storybook" to me, which I always love. :) There are lots of other possibilites to add animal stamps, people, etc to fill out the scene. Today I used the "Thankful for You", you know I love flowers! After stamping these beautiful sunflowers in Memento Tuxedo Black, I colored them with Copics and stamped this script block from "Timeless Textures" over it in Antique Linen, such easy elegance! Next I sponged more Antique linen and a teeny bit of Forest Moss distressing inks over the Deckled Rectangle die before removing. Sentiment is die cut with a Grommet Tag and layered over a Labels Eight die cut from Fresh Asparagus. Cardbase is Pure Luxury Ivory cuttlebgged with the Herringbone folder, I have to say I love this folder on cardbases, the reveal around the edge looks so sharp! I also used some jute and a Pure Luxury Buttons and brads as accents. So, which duo are you getting first?! (That reminds me, I have a few more distressing inks on my list, I might need to pick up a duo to give away to one of you!) Thanks Gina for this fun special, she has some cards on her blog today, too, check 'em out! Sale ends Monday night, September 5th, 11;59 PM CST, don't miss it! Hello and happy Sunday! Hope you are enjoying a good weekend with the family, I am still sick but am enjoying all of us being home together anyway! "In “The Super Red Racer”, kids will learn about the merits of hard work and saving for what they want. In “Cash Flow Planning”, you’ll learn how to live within your means, pay off your debt, and have enough extra cash for saving and entertainment. Listen at home, in the car, or at the gym. It’ll be the best buck you’ll spend all year!" Now I have not attended a Dave Ramsay seminar or bought any of his products in the past, but I did take a 6 week course at my church last year that was based on Dave Ramsey's "Financial Peace University", and it was terrific! Although my husband and I are both very conservative with money, it reinforced several things we believe and already do and emphasized the importance of couples being on the same page, as well as reminding us that everything is from the Lord and belongs to Him. 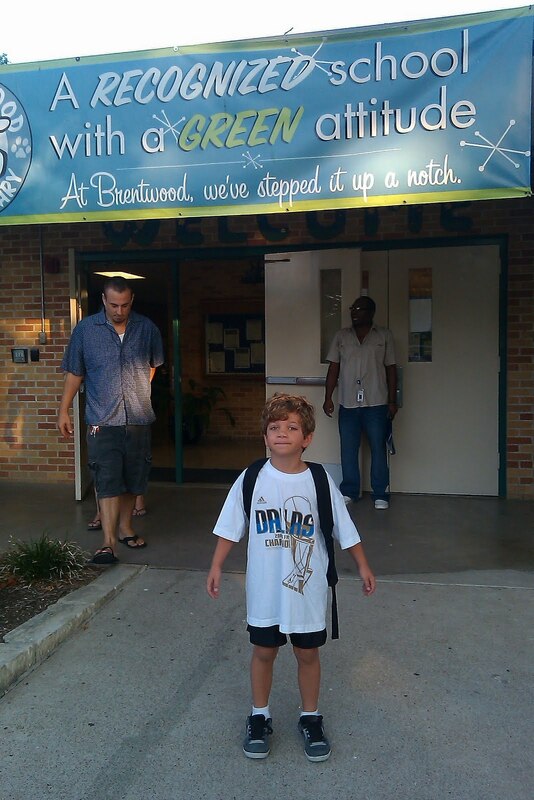 There were many new things we learned as well and I recommended it to several friends. The man who taught it had used Dave Ramsey's teaching to eliminate $100,00o in debt that he and his wife had accumulated over the years to get to a place where they were debt free, living on less than they made and still able to save as well give generously to their church and other charities, and now teaching others how to handle their money. needless to say, it completely changed their lives. So I was really excited when I saw this deal in my inbox because I knew it would be really sound and valuable advice! And for $1, how can you go wrong? A really nice "try before you buy" option so to speak if you decide you are interested in more of his specific lessons to meet your interests/needs! I won't be listening to this immediately because I am under the weather, but I will soon. 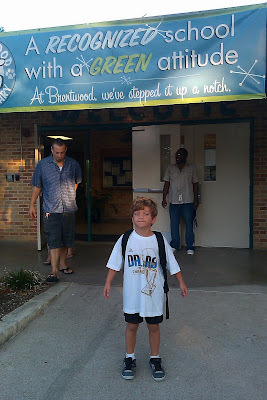 I look forward to hearing the kid's lesson with my boys and talking about it, having a really good teaching moment. I plan to put the lessons on a CD I can loan to friends. The adult one would also be great for a teen or graduate. I hope if you get this deal or not, you would share this link with others who might be really struggling under a lot of debt, have a lot of stress because of money, or have children that could benefit from the lesson. In this economy, I think that covers just about everyone! Hope you will check it out! You never know when in the future someone might come to you for advice on these matters and you could at least point them in Dave Ramsey's direction, I have! I am not really that savvy with money, and fortunately my husband is, but most couples really struggle with money matters, and as the course pointed out, (and I'm sure you've heard or read this before), money troubles are the leading cause of divorce. It could really bless someone to be free of that burden. Right now, Paul and I are at a point where we are trying to teach our children the value of money and these can be very hard lessons to learn, but if learned will last them a lifetime and give them a firm foundation. If you've read any of Dave Ramsey's books or attending his classes, I would love to know! If you buy this deal, you'll have to let me know what you think, okay? Hugs, a card tomorrow with a new set and some good news for you! Thanks for visiting! "For the autumn wreath card, I coloured the leaves & acorn with Copic markers (leaves E31, E35, YG00, YG13, YR02, YR04, acorn E35, E37, E31) and cut them out in sections to fill around the doily die-cut piece (I used pop dots to adhered the leaves for some dimension). I placed an orange button with Baker's twine on top of the wreath. I cut 3 strips of orange lined patterned paper in slightly different widths and attached it to the bottom of the card. In between the thinnest strip, I used my Scor-buddy to make two score lines. I added a chipboard sticker sentiment just underneath the second scoreline, and another section of the leaves & acorn just above the thickest strip for interest. To finish off the card, I added some white dash lines all around the card. (All patterned papers are from Jillibean Soup's Apple Cheddar Soup 6x6 pad). A tip : after cutting out the leaves, I used my darkest brown marker (E35) and run that along the edges so the white edge does not show)"
Stunning card Kary, thanks for the inspiration in all the wonderful details you are so good at creating! :) Please go see Kary's blog for another beautiful creation with this set, this time with flowers! Are you all ready for fall now? I am! I know it is coming, even though it doesn't feel any cooler, I've noticed my car now says the temperature is 94 instead of 104 when I go pick up the kids! I had lunch with William on Tuesday, he's not only okay with me coming up for lunch, but he sat in my lap! (awww) A boy seated at the table name Anthony, whom William just met this year pointed and said, "You are his mom." "Yep," I nodded, smiling. "You love him," he declared. "Yep!" I answered, smiling bigger! :) William asked me to come back for lunch the next day , too. More to come, have a great day, thanks for visiting! Be sure to leave Kary some love on her blog, she has another sweet project with this set! I will be sharing another card she created, this time for Fall, very soon! Have an excellent day! Hello! The kids are back to school (more about that in a bit), so I got a little stamping done! I had this idea to make a tile floor with the Scor-Buddy on white and then stamp lots of random tracks all over with the paw print to look like the "Basket Buddies" puppy tracked in mud, now that's ruff to mop up! I thought about misting the paw print with some water but I thought that might get a little too messy looking. Maybe later! Originally I was just going to have the paw prints and the sentiments, no puppy, like he was off hiding somewhere, but the card needed a little something, so I had to add him back in, along with the "Spring Basket"! (Pretty bold just sitting there grinning, oblivious to the mess he's made!) Make sure to color his feet nice and muddy! Cardstock is Pure Luxury White, Chocolate Brown and Tan Leather, and ink is Memento Rich Cocoa. I also some tied some knots in a double strand of hemp to add some texture to the basket. Have a great day! Don't let the mud get you down! Happy Sunday! I am a few days late on Lee's bookmark challenge, but I don't think I've ever made one of these corner bookmarks before and I realized how simply you could make one with the square frame from "Branching Out"! I stamped the frame on Basic Grey Curio DP with Frayed Burlap distressing ink and then added the sentiment from the coordinating "The Vine" set using Memento Tuxedo Black. Cardstock is Pure Luxury Black Onyx. The distressed pieces in the Basic Grey packs have a ready made vintage look, but you can add lots of texture to any paper with this stamped frame sponging and layering inks or watermarking images. Welcome to week with 3 with Kyra and "Basket Buddies"! Today she has put together this beautifully masked collage of mixed sets and images. I especially love this chocolate point Siamese she colored! Check out her card making instructions below. 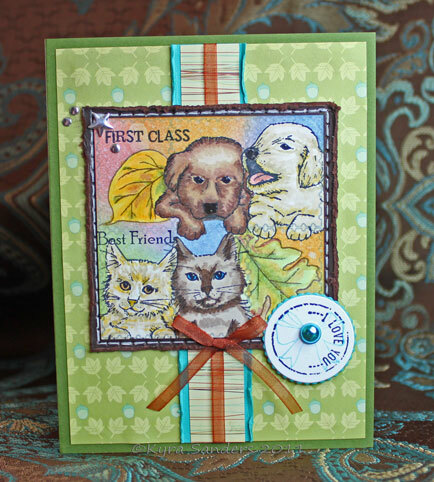 I stamped the postage stamp frame from Tami Mayberry's "Special Delivery" set with London Fog Memento ink. I stamped the puppies and kitties, from "Basket Buddies," with Memento Tuxedo Black ink. I masked the kitties and puppies, stamped the leaves from Melanie's "A Year of Leaves," and put masks over them as well. Using Ranger Distress Inks, I blended colors around the masked images to build a base background. I sprayed the piece with water and dripped alcohol in a few places on the ink background. Note: when working with alcohol, always apply it and let it dry before using alcohol based markers. When everything was dry, I removed the masks and colored the images with Copic markers. I put glossy accents on their eyes and the puppies' noses, and set them aside to dry. 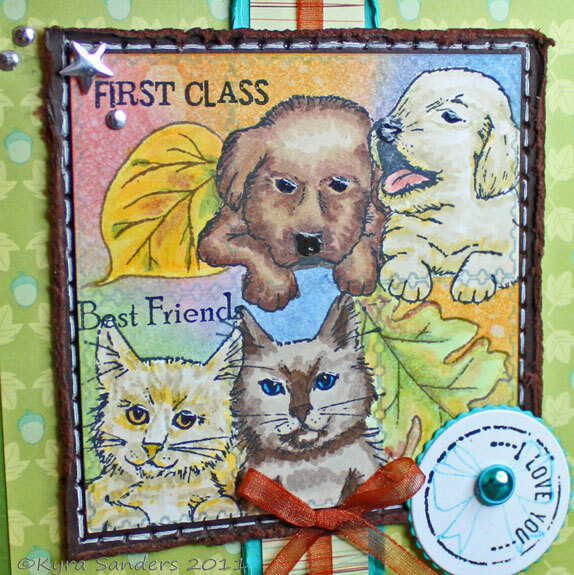 When they had dried, I stamped "First Class" and "Best Friends" on the panel. I stamped Tami's "I Love You" cancellation in Tuxedo Black, then stamped the bow from "Basket Buddies" over it. I cut out the cancellation and bow image, and a coordinating scalloped circle. I cut out the bold Chocolate Chip pure luxury base, distressed it a little, then used my faux stitching method to give it a nice finish. I adhered these four pieces together, then set aside to finish the rest of the card. The base is Fresh Asparagus Pure Luxury, topped with a 5.25" x 4" piece of Cosmo Cricket Leaf and Acorn paper. The center piece is Pure Luxury Blue Raspberry, slightly distressed, topped with a coordinating striped paper from Cosmo Cricket and a line of Hobby Lobby organdy ribbon and bow. I assembled all the pieces, then added the star and nailheads to the upper left. The center of the bow is a Robin's Nest dew drop. I used the Center Stage Spotlight Alumni's sketch for the design. Now please go see Kyra's blog for another inspiring project! Love this bag, what do you think? Day 3: "Various Verses" and "Gnome One Like You"
Day 2: "Basket Buddies" and "Heartfelt"